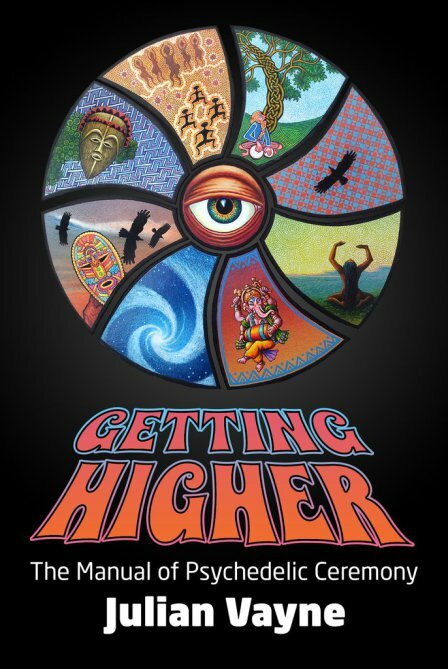 In the video trailer Julian describes Getting Higher as “a manual for exploring the use of psychedelic substances in the contexts of spirituality, self-transformation and magic. This is the psychonaut’s essential guide. The techniques presented here work whether you’re a scientist or a shaman; there’s no requirement to believe in anything other than the wonder of your own neurochemistry and the value of the psychedelic experience”. And indeed, although it is a slim volume, it is a veritable fountain of information. The first part is preparatory work with detailed information about “the psychedelic experience”. In the section “Core Techniques” Julian describes how one can navigate a psychedelic experience. Using Breath techniques for example. Or Ritual Singing practices including dancing and movement. Internal journeys or what we sometimes call pathworkings can also enhance the experience. 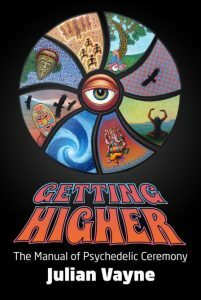 Weaving magic in an ‘altered state of consciousness’ is perhaps the real guide Julian is presenting in this book. As I was going through the book I also realised that much of what Julian is describing is what we often call trance-work. Written by Julian Vayne, Foreword by David Luke, illustrations by Pete Loveday. Published 1st May 2017 by Psychedelic Press UK. With thanks to G&F, Nikki Wyrd and the spirits of Devon & Cornwall. Thanks to Amodali Zain and Mother Destruction for permission to use their music. With gratitude to the Medicine Community and star-spangled dreamers the world over. Ahoy!